Nixon Motor Sports: How Can I Start Autocrossing? One of the best things about autocrossing is that it is easy to start, you just have to start somewhere! For the next event in our South Carolina Region, it's as easy as 1-2-3. 2. Follow the instructions and sign up. You don't have to pay yet, and you don't have to be a Sports Car Club of America member yet. 3. Show up on April 27th with your car and be prepared to have fun! Once you are at the Michelin Proving Grounds, you will find workers who will ask you to sign the waiver form. After that, you will find the registration folks in the big van who will help you finish registering and then paying to enter. You can pay with cash on site, and if you are not a SCCA member you can also pay for a weekend membership so you can drive. Then you just have to have the Tech inspection to make sure that you and your car will be safe, so they will check for things like tires, seat belts, wheels are fastened securely, and that you have a helmet. If you don't have a helmet, there will a bunch of loaner helmets you can borrow for free. 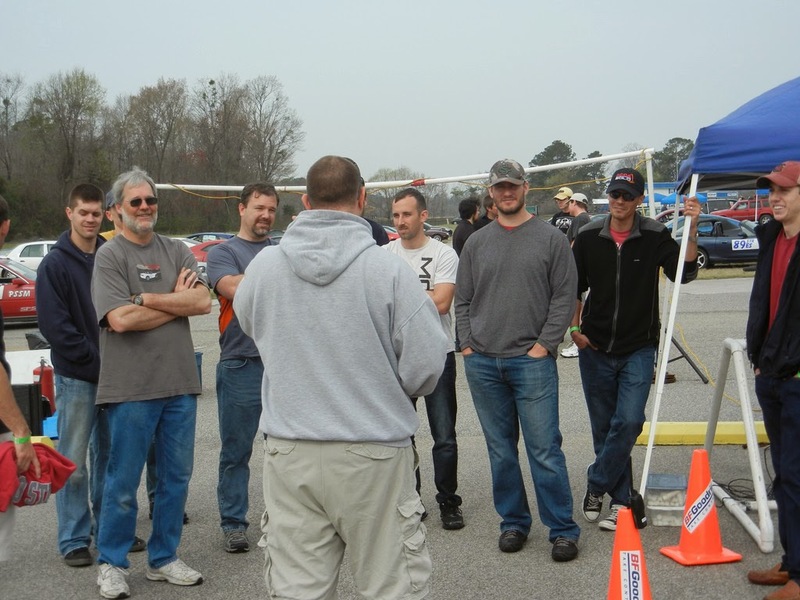 If you get thru steps 1-3, then you will be attending the driver's meeting to cover any important rules for the day, and then you should join the Novice track walk where one of the experienced members will talk you thru the course as you walk it. After that you can walk the course on your own and get a picture of it in your head so that you can drive it later and not get lost! In the photo above you can see Andre in the black hat listening to the Novice talk. As of right now, here is a partial list of driver's signed up, so you know that NMS will be there at Michelin on April 27th. How much fun is it? I don't think you would believe me if I told you, and since a picture is worth a thousand words, this short video (really a Tire Rack commercial) shows how much fun it is to be an autocross driver! Tire Rack "This Is Kenny"
The registration can look a little confusing if you don't know what class to be in, but don't worry about it! You can sign up in any class and then the good folks at the event will make sure it gets properly adjusted when you get there. You can try to look up your correct class in the rule book at the SCCA's website, or drop us an email and we'll be glad to help, or guess one of the Street classes. PAX will most likely be "none", and then pick a number!